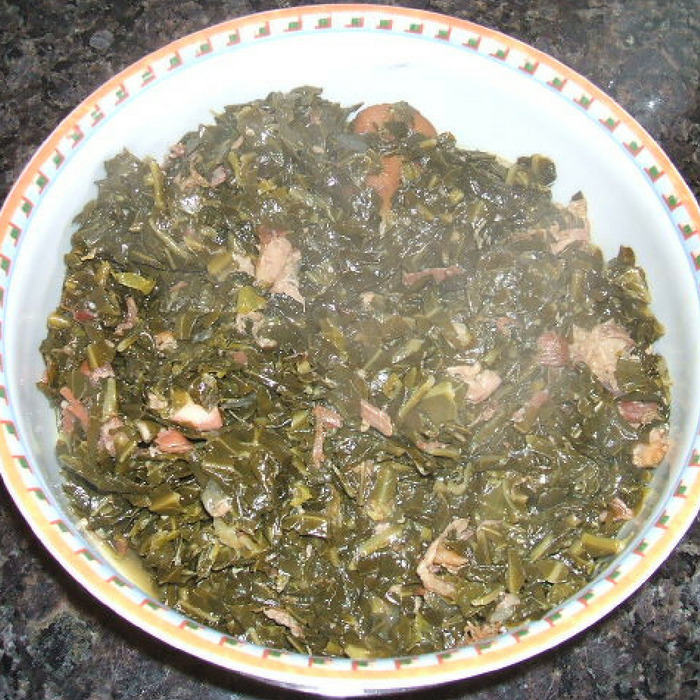 Collard greens and ham hocks are a popular dish among southerners. Just about any respectable southern cook has his or her own recipe for making collards. If you'd like to try your hand at making homemade collards and ham hocks read on because I have the ideal recipe for you to experiment with. I say experiment because this is an easy starter recipe designed for the beginning cook who is looking to learn to prepare delicious homemade foods. All said, this recipe is for you whether you are a seasoned cook or someone just looking to experiment. As always the key to great cooking is to be prepared and use quality ingredients. Properly selecting your bundle of greens is very important. Go to your local grocery store or farmer's market and select 5 pounds of young leafy collard greens. You will select more than the recipe calls out because some leaves will be unusable and the large stems will be cut off and discarded. Start off by cooking your ham hocks. Place ham hocks in Dutch oven. Add water and bring to a boil. Reduce heat, cover meat and simmer until tender. This should take about 1 hour. Don't allow the water to cook out. While the ham hocks are cooking go ahead and prepare your greens for cooking. Rinse your greens several times under cold water to remove dirt or sand. After greens are clean, stack several leaves on top of each other. Using a cutting board and knife, roll the leaves together and cut leaves into 1 inch thick strips. When your ham hocks become tender go ahead and add more water, the collards, sugar and hot peppers to the Dutch oven. Add greens to the pot until the pot is full. Most likely all of the greens will not fit. Just allow the greens to cook down and continue adding until all of your greens fit in the Dutch oven. Cover greens and continue to simmer for about 1 hour, until greens are tender. Stir your greens often and keep sufficient water level to all the collards to simmer. About halfway through cooking add salt and pepper to taste. Serve your southern greens and ham hocks with your favorite meat and corn bread.